As I watch the Fort McMurray fire in Canada grow, I realize reality that it can happen in any forest. The majority of fires are caused by humans, most of which are accidental. And with more and more folks heading into the woods, that danger keeps growing. Knowing and implementing proper campfire techniques will undoubtedly save many acres of forestry. In real estate, they say that location is key. The same goes for a campfire. I narrowly avoided disaster once as I set a lying dead tree on fire. I thought I was far enough away but the wind came up and carried an ember. I was lucky. Look around for possible ignition sources nearby and look up. More than one wildfire was started when a low hanging bow caught fire. Also, be aware that thick pine needles on the forest floor go up quickly. Once you’ve found a good location, clear out a 10 to 15 foot circular area. Always try to be downwind from hazards and your tent and gear. You never can be certain about the wind and if it’s gusty, consider a very sheltered spot or go without if you can. If you’re adamant about building a fire, build a smaller one when wind is an issue. Time and time again I see folks with huge campfires. Although fun, they can be disastrous if not impeccably maintained and watched. Smaller is always safer and you don’t need a huge fire to cook over or provide warmth. Indigenous people almost always built small fires unless there was a celebration going on. And speaking of our ancestors, they usually made fire pits instead of round stacks of rock. The problem with the latter is that in order to get good warmth, you need to pile up the wood above the top. You’re not gaining anything by doing this and now you have a lot more coals to extinguish and more of a chance that you’ll leave some warm ones when you leave. A good fire pit only needs to be about 8 to 10 inches deep and a couple of feet wide. You’ll be surprised at how close you can get and how warm it is. You can also see all the coals when you put it out. Many times with rock rings, coals get into the spaces between the rocks and don’t get extinguished properly. All it takes some wind to re-ignite those coals. Any you may be miles down the road. The key to a useful fire is the wood you use. Softer wood and dead bows burn much faster and put out less heat. They also go up quickly and send off a lot of sparks. 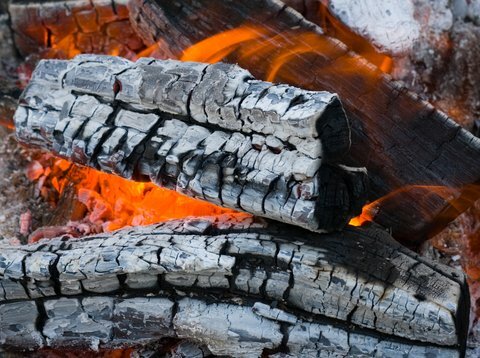 Manzanita, oak, service berry and other hardwoods burn slowly, provide more heat and turn into hot coals. Hot coals will always provide more heat than open flames. They are also much more safe. Build a good coal bed and you’ll probably have to move your chair back. Most importantly, make sure campfires are legal to build where you’re at. Always use a fire ring if one is provided. There are usually campfire restrictions in the backcountry and for good reason. Don’t take that chance, it’s not worth it. If you have a green light on fires, be responsible and make triple sure it’s out before you move on. Put your hand in there if you’re not sure. A slight burn on the finger is better than a wildfire any day of the week.